A Hotshot fire crew member rests near a controlled burn operation at Horseshoe Meadows as crews continued to fight the Rim Fire near Yosemite on Sept. 4. Hot, dry California weather through the weekend is expected to add fuel to the massive wildfire scorching Yosemite National Park, possibly undoing some of the gains fire crews have made in the past week, authorities said Friday. 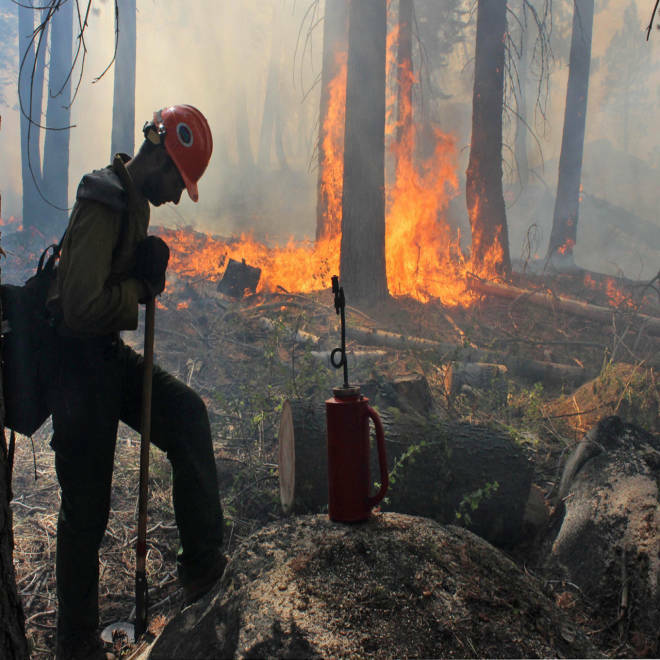 The so-called Rim Fire has grown by 10,000 acres since Thursday, to almost a quarter-million acres, the joint federal-state-local incident team said Friday afternoon. It could grow even more as the weather increases the chance of embers' shooting across containment lines into dry timber. The fire, which was started Aug. 17 when a hunter's illegal campfire burned out of control, is now the third-largest blaze in state history, authorities said. Plumes of smoke triggered air-quality warnings a hundred miles away and chased off would-be day campers in Yosemite. It remained 80 percent contained, and the last major evacuation order was lifted Friday when park officials reopened State Route 120 from Groveland — the main approach to Yosemite. Full containment isn't expected for another couple of weeks. "It was one of the largest fires, and the behavior was a real challenge," Andy Kellogg, chief of the Tracy Fire Division, told NBC station KCRA of Sacramento. "The fire behavior was different than what we were used to seeing," said Kellogg, who served nearly two weeks on a strike team battling the fire. Tracy firefighter Ray Gonzales said the fire "was overwhelming at times." "But to see how many people it affected on a large scale is very heartfelt," he said.